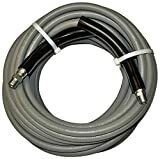 This JGB Eaglewash I wrapped grey 50' hose is manufactured for pressure washer equipment with working pressures up to 4,000 psi. Its modified nitrile synthetic rubber tube offers maximum resistance to both petroleum-based oils and animal fats, while its modified neoprene cover is highly resistant to both abrasion and oil. Its braided wire reinforcement provides the strength necessary to reach and maintain its maximum pressure rating, and it is capable of functioning effectively at temperatures up to 310 degrees F (154 degrees C) and has a minimum burst pressure of 12,000 pounds per square inch (psi) and a maximum working pressure of 4,000 psi. It comes fitted with a 3/8" male National Pipe Thread (NPT) coupling and a 3/8" male NPT swivel coupling with guards. This pressure washer hose is suitable for applications using typical cleaning chemicals of the wash industry. D = Delivery method (volume and velocity)The inside diameter of the hose must be adequate to keep pressure loss to a minimum and avoid damage to the hose due to heat generation or excessive turbulence. The hose must be capable of withstanding the minimum and maximum temperatures that occur within the hose system. Some applications require specialized oils or chemicals to be conveyed through the system. In this case, hose selection must ensure compatibility of the hose tube, cover, couplings and O-rings with the fluid used. Industrial hoses are used in systems such as air compressors, automatic manufacturing operations, aircraft controls, and tire installation in industries including agriculture, mining, road construction, firefighting, and aviation. JGB Enterprises manufactures and distributes hoses and hose assemblies for commercial and military applications. The company, founded in 1977 and headquartered in Liverpool, NY, meets International Organization of Standardization (ISO) standards 9001:2008. Interested in the JGB Enterprises Eagle Hose Eaglewash I Wrapped Grey Modified Nitrile Pressure Washer Hose Assembly, 3/8" NPT Male X NPT Male Swivel with Guards, 4000 psi Maximum Pressure, 50' Length, 3/8" Hose ID? Is the price too high? You can easily price watch this product and we'll notify you when the price reaches your target.